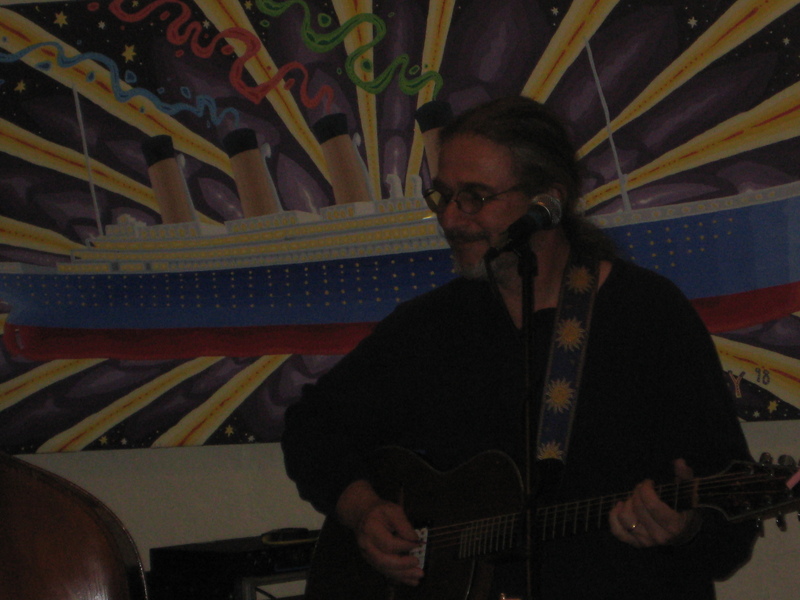 For 20 years, Virginian Larry Keel has explored various corners of the bluegrass music world, first with the progressive bluegrass of McGraw Gap, then with the even more adventurous Larry Keel Experience, and currently with the more traditional-based Natural Bridge. Though he’s done plenty of different things, Keel wouldn’t have it any other way, he says. The Williams connection goes back a ways, and Keel, along with his wife Jenny, have a new trio album with Keller Williams coming out in late May. The best thing about the new songs so far, he says, has been the crowd reaction at the shows. It’s those kids who are the fastest growing part of the bluegrass audience who will appreciate what Keel does the most, but Keel says what he, Williams, and others are doing will bring those new fans into the more traditional side of bluegrass, too. Other than touring and recording, Keel has another new project he’s put out there; a website called Fishin’ and Pickin’ (fishinandpickin.com), which is exactly what it sounds like — a site for people who like to fish and who also enjoy live music. There are different kinds of fame and ways to get it. One kind is achieved through a publicity machine, packaging and selling a talent to the masses. Another means is the talents taking it to the masses themselves, demonstrating directly why they deserve to be on the cultural map. The first is a manufactured product, the second is a more organic, and some might say, honest approach. As the music business has shifted, because of a shot in the proverbial foot, the prepackaged artist is becoming rarer. Donna the Buffalo is in the enviable position of being a homegrown entity, a group that finds itself outside the coloring lines of the accepted formula, a formula that is now in the past tense. To better grasp this, let’s crunch some numbers: The Rolling Stones has been touring, roughly, for 45 years, U2 for 35. Donna the Buffalo (DTB) has been touring for 21. While not sharing the god-like fame of the Stones or U2, the band has major street cred, a rabid fan base known as “The Herd,” nine albums and the admiration of their peers. Continuing, as Bob Dylan calls, “the never-ending tour,” DTB will be in Wilmington on May 8 at the Greenfield Amphitheater. Timing is everything. As stated above, there are different ways to exist in the music world. Whenever I have heard comments about DTB, it has always been what a great live show they put on. Fronted by Nevins and Jed Puryear, who is the other principle songwriter, they also comprise Vic Stafford on drums, David McCracken on keyboards and Jay Sanders on bass. I asked Nevins about transferring the live experience to the studio. They mix an eclectic oleo of American music from Zydeco to Bluegrass, Rock and Old Time, yet maintain a consistent sound that is unique to their band. DTB, self-made, self-propelled, years of road under those belts, existing in a solid niche. I wondered what comes next. TN: “We own our bus, we travel with band and a crew consisting of driver, house and monitor sound men, and a person in charge of merchandise production and sales. We have a manager, booking agent, our own in-house publicist. Our most recent record came out on Sugar Hill Records. Musically, we are enjoying playing together, have had many personnel changes over the years, and have certainly grown and learned a lot with each change. Never thought about exactly where we’d be, really. People doing what they love, and better, sharing that passion to the benefit of the public, is the strongest business formula ever written. Donna the Buffalo is living proof of that. Lucky for them. Lucky for us. Everybody wins! Mad Tea Party brings the Party back to the Tea Party! The Asheville Tea Party is a grassroots movement of regular people on a mission to take back their government. Call them citizen crusaders. They’re mad as hell, and they’re not gonna take it. But don’t call them The Mad Tea Party. 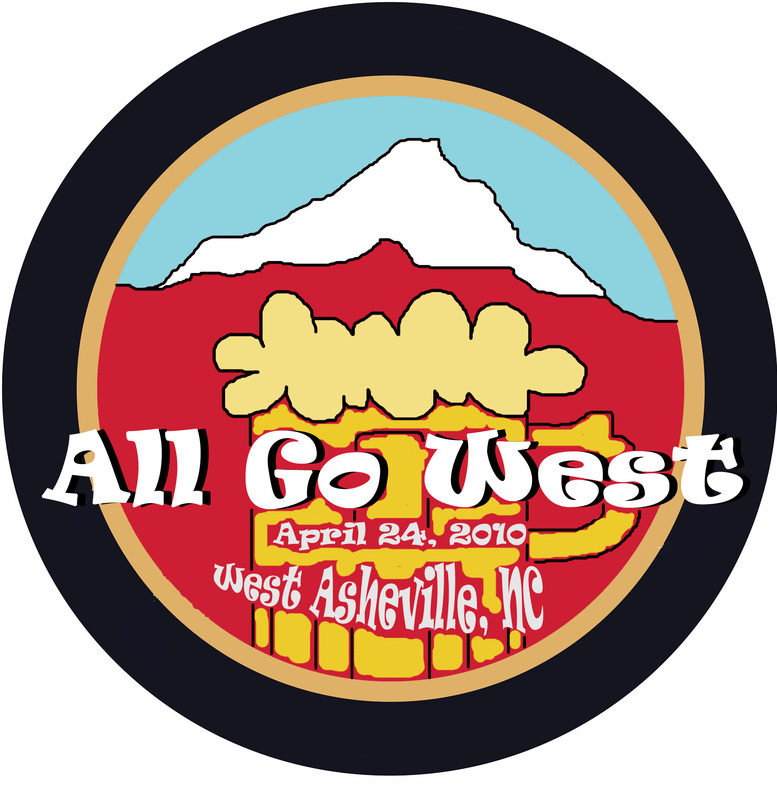 That would be the name of Ami Worthen and Jason Krekel’s popular Asheville band. They’re known for their ukulele-powered rockabilly. The musicians have been on the local scene a good bit longer than the folks with the political agenda. Yet it seems that some folks are getting the two mixed up. So the band decided to have a little fun. 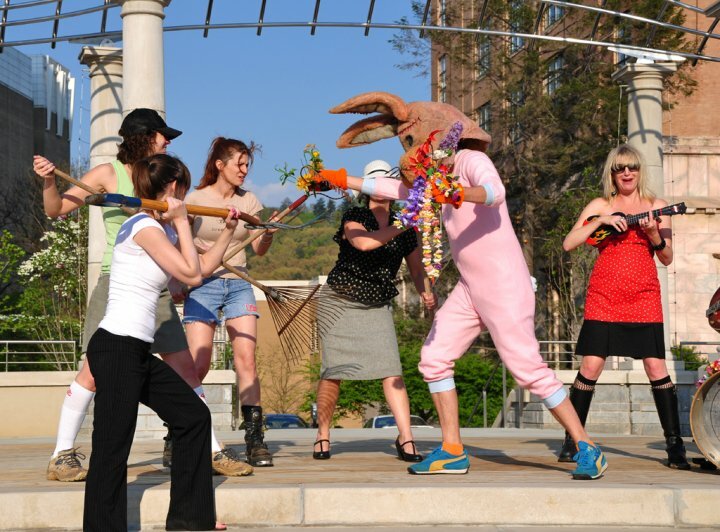 During the Asheville Tea Party’s protest on Tax Day last week, Worthen and Krekel showed up with their instruments, a cameraman and a few extras, including a dancer in a bunny costume. It was a classic Asheville “when worlds collide” moment.